One of the first things people notice about you is your smile, and as such, you want your teeth to look as best they can. With the many innovations in the field of cosmetic dentistry, Dr. Kevin Sands can correct a number of teeth imperfections and brighten your smile with beautiful, natural-looking results. Our cosmetic dentist in Beverly Hills offers a range of effective treatments to correct stains, chips, gaps, misalignment, and other dental issues. yet they were so perfect. With Zoom!® teeth whitening treatment, tooth discoloration caused by staining foods and beverages, tobacco-use, and aging can be significantly lightened for a brighter, more beautiful smile. This state-of-the-art in-office procedure has been proven to whiten teeth by up to eight shades or more. Treatment sessions typically last about an hour and the results achieved with Zoom!® can be long-lasting with proper follow-up care and daily dental hygiene. For more information regarding this procedure please visit our Zoom!® teeth whitening page. With the ability to correct a wide number of common tooth imperfections simultaneously, porcelain veneers are one of our most popular cosmetic dentistry options. Porcelain veneers can conceal the appearance of chips, cracks, gaps, spaces, stains, discoloration, and even mild tooth misalignment. These thin, durable, custom-made porcelain shells are affixed to the front surface of the tooth for natural-looking, long-lasting results. Dr. Kevin Sands works with a high-quality lab to create veneers with an optimal fit and superior esthetics. Most of our patients find that porcelain veneers both look and feel just like natural teeth. With proper maintenance and care, your porcelain veneers can help you enjoy a beautiful, youthful smile that lasts for decades. Invisalign® orthodontics is an effective way of straightening your teeth as discreetly as possible. Instead of cumbersome metal braces, Invisalign® involves a system of clear, removable teeth aligners that are virtually invisible. You can even take them out while eating, drinking, brushing, and flossing. Each set of aligners is custom-designed for your teeth. After two weeks, you remove the set of aligners and replace it with the next one, each set made for the gradual straightening of the teeth. Invisalign® is not only a more comfortable (and more aesthetically pleasing) alternative to traditional braces, in many cases, beautiful results are achieved in less time. Excess gum tissue, sometimes referred to as a “gummy smile,” can shorten the appearance of your teeth and impact the proportion of your smile. A gum lift is a cosmetic dentistry technique used by Dr. Kevin Sands to reshape the gums, lengthen the appearance of the teeth, and help you renew your smile with beautiful results. By recontouring gum tissue with state-of-the-art laser technology, Dr. Sands can both minimize your recovery time and improve balance and symmetry between the teeth and gums. One of the most common and effective dental treatments available, dental bonding can correct small cracks and chips in the teeth with natural-looking results. In some cases, this treatment can serve as an alternative to orthodontic treatment for patients who have mild spacing issues between the teeth. A full mouth restoration can resolve a number of dental issues to help you renew both form and function of your teeth and gums. With a combination of procedures in a treatment plan created to address your specific needs, Dr. Kevin Sands can whiten your teeth, restore missing or damaged teeth, improve the health of your gums, and more. Full mouth restorations can give you a beautiful new smile! 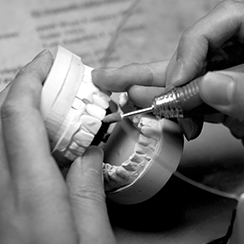 Porcelain dental crowns are custom-designed to restore teeth that are affected by severe decay or damage. They are also used in conjunction with root canal therapy to rebuild the full structural body of the treated tooth and protect against further damage. The crowns we offer are created from high-quality materials, making them durable, long-lasting, and aesthetically pleasing restorations. Crowns can be very effective for supporting a large filling, protecting weak teeth from fracture, restoring fractured or chipped teeth, and many other issues. They are made to cover the entire tooth, and are specifically designed to produce the most comfortable fit and natural-looking results. 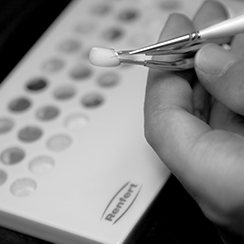 Each crown is color matched and custom designed to blend beautifully with surrounding teeth. In many cases, porcelain crowns are the most suitable choice for preventing the extraction of a badly damaged tooth and restoring its natural appearance. Dark, metal-amalgam dental fillings are no longer the optimal treatment for cavities. Dr. Sands now exclusively uses tooth-colored composite resin to effectively fill cavities and prevent filling-related complications in the future. The material is not only strong, durable, and long-lasting, but it is custom matched to the shade of your natural tooth for a flawless result. The fillings are virtually undetectable and help maintain a brighter, healthier smile. It is common for patients with several metal fillings to request replacement with tooth-colored composite fillings for an aesthetic upgrade and improved protection against further decay. For individuals missing a tooth or series of adjacent teeth, a custom dental bridge can provide an effective option for restoring a full smile. Dental bridges typically include a porcelain tooth replacement fused to two dental crowns on each side. In addition to filling the gap left by a missing tooth, dental bridges can prevent teeth from shifting, enable proper chewing, and improve speech. 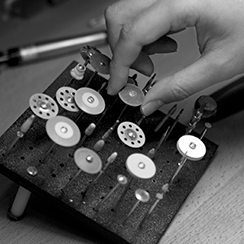 To provide a natural look and optimal fit, each dental bridge is custom-made according to the patient’s specific needs and cosmetic goals. Dental inlays and onlays reinforce the surfaces of the back teeth to prevent the invasion of bacteria. These commonly performed treatments can reduce the chances of cavities and further decay from setting in. Inlays and onlays can also be very beneficial for teeth that have small fractures or cracks, ultimately giving them enhanced strength and support. Composed of a strong ceramic material, inlays and onlays are made to blend in with the color of your natural teeth – they are barely noticeable after they’ve been placed.